An homage to Tina Turner, we present you the Turner collection, mid-century luxury lighting that won’t leave your mind! 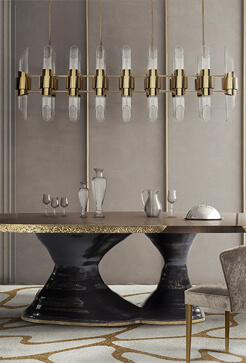 Discover the magic of lighting as DelightFULL pairs up with sister brand Essential Home to bring you weekly reviews of inspirational lighting pieces that are simply too hard to resist. Today, the Turner collection is under our radar and we’ve taken a look at this versatile lighting piece with incredible potential! The best art deco lamp is right here and we can’t wait to show you more! Turner comes into your home in different ways. You’ll find it in suspension, wall, table and even floor, bringing light in whichever shape and design you so please. However, when you choose suspension, you’ll find a world of gold tones shinning brightly by the light. Paired with black leather and white marble, you’ll find yourself completely bewitched by your new lighting piece. Bring nature into your home with a simple green color scheme that is easily completed with an incredible wall lighting lamp such as the Turner. Its gold and white tones go along with everything and make this a piece that is desirable and versatile for any room of your home. There is nothing like bringing a piece of trendiness into your home. With Turner table lamp, you’ll achieve that modern look you’ve always been searching for. Pair it with a fluffy rug and a modern black chair and you’re in for a treat! There is no going wrong with this incredible lighting piece. Free like the sea, Turner enters your home like a breath of fresh air and a vision in white and gold. A floor lamp that is both modern and incredibly stylish, Turner is your next go-to when it comes to lighting pieces, the one you’ll choose each time for every occasion. Previous What’s Hot On Pinterest: Copper Elements In Decor!